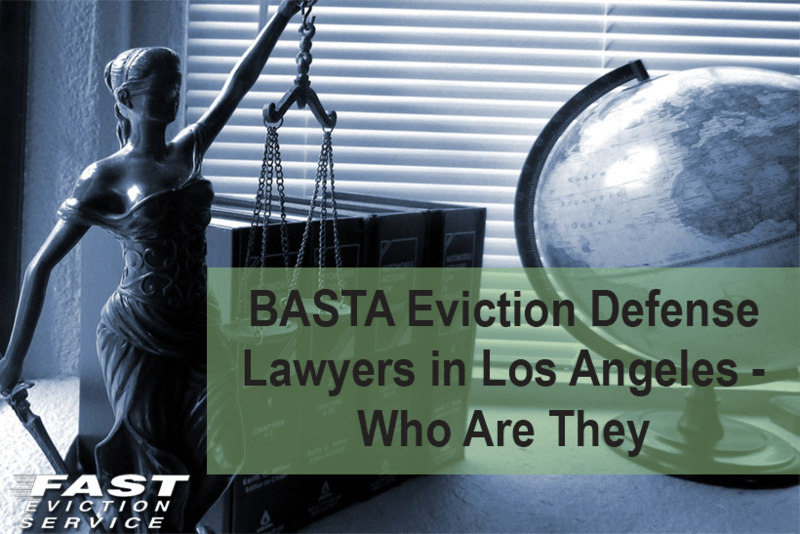 BASTA Eviction Defense Lawyers in Los Angeles – Who Are They? You have a tenant who refuses to pay rent. You have served a 3-Day Notice to Pay Rent or Quit which has expired. Your attorney files an unlawful detainer case in the Los Angeles Superior Court and you are then notified that a firm called BASTA files an answer to the complaint alleging that “You have breached the Warranty of Habitability” or that your action is a “Retaliatory Eviction” or some other ridiculous defense, and this BASTA is demanding a jury trial. Now what? This article will attempt to explain who BASTA is, what their role is in an Unlawful Detainer case, and what do you do when BASTA becomes involved. BASTA – Who Are They? BASTA, when translated into English, means “Enough”. BASTA is one of the many tenant unlawful detainer defense firms that litigate unlawful detainers lawsuits for the tenant. When you call BASTA and you get their answering machine, you are greeted with “If the landlord wants a fight…we will give them a fight”. Sets the tone right? What they really should say is if you want to pay us $5,000.00 and waive all the rent owed, we will forgo a jury trial – otherwise we are going to make you spend lots of money to evict your tenant no matter what. If you haven’t read the article “How Superman of Renters Daniel Bramzon Revolutionized L.A.’s Eviction Defense Industry” published by LA Weekly in December, 2014, I advise you to do so. BASTA professes to be the champion of the poor however it is common knowledge that BASTA receives a large chunk of the money that landlords pay out to avoid a jury trial. Why Are Jury Trials Allowed? I can’t tell you how many times a client will ask me that question when they do not want a jury trial. The answer is simple – you don’t have a choice. It is a constitutional right to have a trial by a jury of your peers. BASTA takes this right to new heights by requesting a jury trial for every tenant. Usually, you find out that your case is a BASTA case when they file an answer checking every single box on the form. The next step is the discovery process. Here you find out that your tenant, in most cases, is complaining about the habitability of the unit. Watch out for this! BASTA usually will advise the tenant to call the Housing Inspector and complain to a governmental authority. Further, if you happen to be cited, BASTA will have the further audacity to advise the tenants to not allow you access to YOUR RENAL UNIT to make repairs. Normally, BASTA will send you a letter with their discovery requests, especially in rent controlled areas like Los Angeles, California. In that letter they will say that if you don’t wish to respond to the discovery and would like to settle the case, you can pay the tenant anywhere from $3,500 to $5.000, waive all rent and allow the tenant 60 to 90 days to vacate. It’s absurd! What can you do as a Los Angeles landlord? The answer is fight back. If BASTA wants a fight give them a fight. Serve discovery on them and find their weaknesses and put them on the defensive. As stated above, whenever BASTA represents a tenant in an unlawful detainer case they will request a jury trial. The tenant will have filed a Fee Waiver which allows them to litigate the case for free. BASTA, who claims to represent indigent tenants, has their fees paid by grants that they receive from the Federal and State Government. You are not so lucky. You have to pay the filing fees and your own attorney fees to reclaim your rental property. BASTA normally will show up first day of jury trial and the game playing begins. They have so many cases that your attorney usually will only get 15 to 20 minutes in the morning to speak with them. The usual demand is $5,000.00 for non-rent control cases and $10,000.00 to $18,000.00 for rent controlled properties – simply to get your property back from a non-paying tenant! The worst part of the whole equation is that the judges in Los Angeles allow the game playing and cater to BASTA’s schedule. If they are engaged in trial their case will be continued to a “firm” date sometime a month later. This means that you can expect to come back two or three times to court before your case either gets settled or is sent out to jury. What is the best way to avoid paying BASTA or any tenant litigation defense firm money, which is what they want? Don’t back down and don’t pay them money. If you pay them their extortion fee of $5,000.00 because you don’t want to fight a jury trial and hire an attorney to represent you, you are setting a bad precedent. Further, BASTA will remember you and your property. You can bet that on your next eviction BASTA will represent the tenant and will demand the same monies you paid on the other case. Lastly, if you are one of the unlucky landlords who have lost a case to BASTA and they have a judgment against you, run to the nearest post office and mail them a cashier’s check for the attorney’s fees that they received in the judgment. If they don’t get their money right away, they will double the judgment in a month’s time for asset searches, abstracts and research and it is all legal. Whatever you do, if you are a Los Angeles landlord do not represent yourself in an eviction if BASTA is on the other side. They will outmaneuver you. Get a Landlord Eviction Lawyer like Fast Eviction Service.